Sauna is being used since centuries for its incredible health benefits. Besides the health benefits, several people just enjoy sitting inside a sauna to relax. Beyond relaxation, sauna can offer many additional benefits which are interesting to see. A sauna is a room which is heated to achieve a temperature between 70 and 100 degree Celsius. Humidity in a sauna is usually between 10 and 20 percent but in some types of sauna, it’s higher. For example, in Turkish style saunas, humidity level is higher. Traditional Finnish saunas involve dry heat. A sauna can elevate the skin’s temperature to around 40 degree C. With the rise in skin temperature, there is heavy sweating. The heart rate rises as the body tries to be cool. Losing about a pint of sweat just within a short time in a sauna is not uncommon. Wood Burning: In this type, wood is used to heat the room and rocks. These saunas are typically low in moisture and high in temperature. Electrically Heated: Just like wood-burning sauna, electrically heated saunas too are low in moisture and high in temperature. Here an electrical heater is used by attaching it to the sauna floor. Infrared Room: Infrared saunas are different from wood-burning and electorally heated saunas. Here only the person’s body is heated using special lamps, instead of the entire room. The room gets warm ultimately but not like other saunas. Steam Room: These are not traditional saunas but still called saunas because of the similarity in effects. Instead of dry heat, highly moist heat is used in steam rooms. Irrespective of how heat is achieved in a sauna, health benefits are similar. Firstly when a person sits in a sauna, heart rate is increased and blood vessels widen because of which circulation is increased. Increased circulation may help lessen soreness of muscles. It also improves joint movement and relieves arthritic pain. The heat in the sauna also brings about relaxation which promotes feeling of well-being. A major health benefit of sauna is reduction in the risk of heart disease. This has been proven from a study in Finland in which men who used sauna more often were found to experience sudden cardiac death less often than those who used it only once a week. One theory on sauna is that sitting in a sauna has effects similar to moderate exercise. Increase in heart rate up to 150 beats per minute, pumping out of more blood etc are all similar effects to exercise. Another theory is that sauna helps improve the function of heart cells and cells lining the arteries, because of which amount of blood flowing to the heart improves, thus heart function gets a boost. Sauna flushes toxins through increased sweating and clears skin. Due to increased relaxation, sauna can induce a deep sleep. Sauna burns surplus calories and brings about weight loss. Visit MedicalSaunas.com – 3D Heat Therapy™ for pain relief. 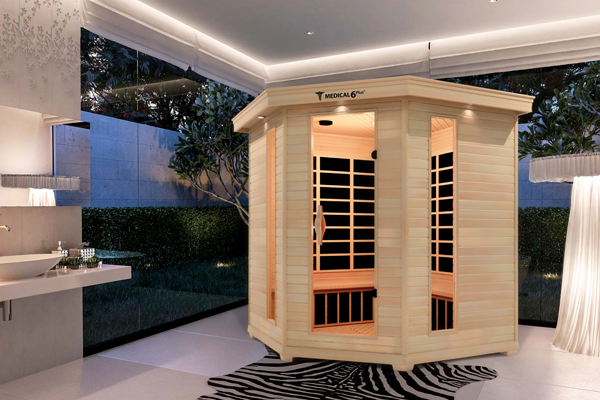 Here you can view their range of saunas which offer great health benefits.